I went to the Artists’ Book Fair at the Fruitmarket gallery a few weeks ago and bought a little ‘boiled book’ by the artist, Kerry Douglas. I thought it was very beautiful and I wanted to experiment with the process. She had given me a few instructions on what to do and said there was lots of information on the internet. I am never very good at following instructions so I just experimented myself. The first attempt was not hugely successful as the prints were fairly soft and the paper broke up a little. I have been sewing some previously made ecoprinted silks onto the pages to reinforce it using the freehand embroidery foot on my sewing machine. The pages feel a bit like a baby’s fabric book but I think the end result will be quite pleasing as it has a very worn and weathered feel about it. 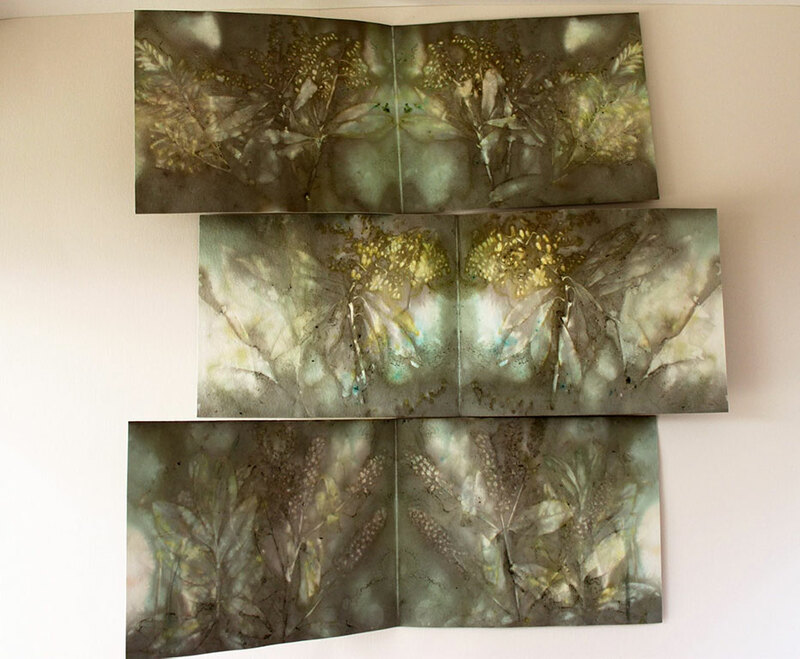 It is difficult to take good photographs of books but i have completed one of the books using an ecoprinted silk for the cover. 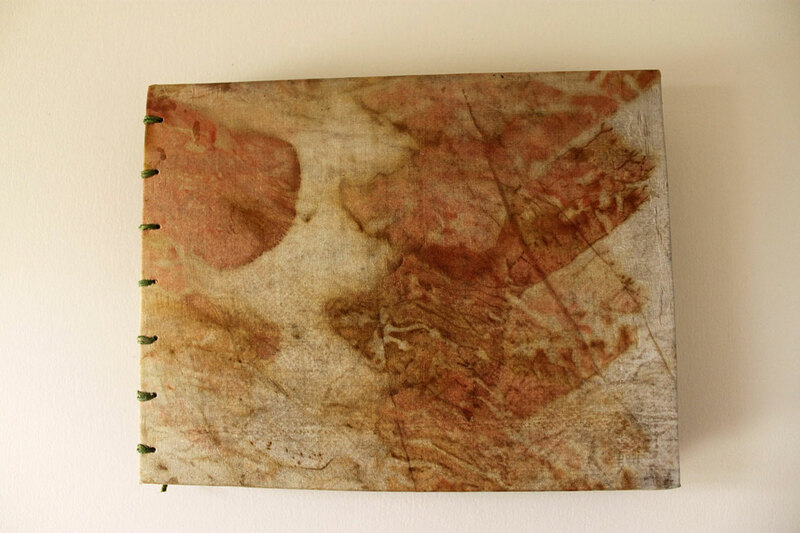 The Eucalyptus leaves made a beautiful pink imprint on the silk and the boiled pages are made with Mahonia and fern leaves. 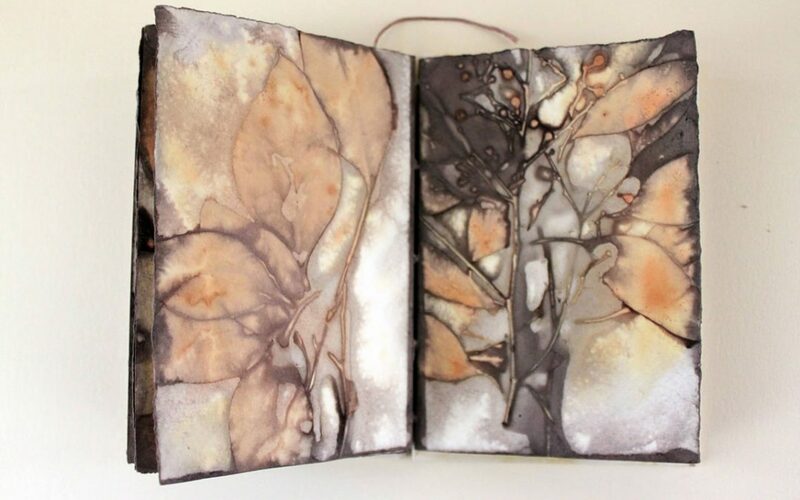 I had to really resist drawing into the book but I felt that the soft greys, greens and rusts gave a rather mysterious effect. In the slighter greener pages I added some natural dyes that I had bought in Morocco. I haven’t been able to get quite the same clarity of leaf prints as Kerry’s one but I think the process does have lots of potential. When I am next in Australia I will try again as the Australian eucalyptus and banksia leaves are very good for natural dyeing.